Crisp, sweet and juicy is what I look for in an eating apple, none of those grainy mushy varieties for me – I’m looking at you Golden (not so) Delicious! The Jazz Apple is a cross between a Braeburn and Royal Gala and fits my apple requirements perfectly. It has a good crunch and a refreshingly vibrant flavour. Originating from New Zealand, Jazz Apples are grown under licence in the UK and has a fruit bowl life of up to four weeks. They’re eaten way before their shelf life in my home, as I love to snack on an apple, and they are perfect to eat when on the go. Jazz Apples are versatile and great eaten raw or cooked. I’ve created a recipe, which combines the best of both: A light Pavlova topped with cooked apple curd with a scattering of raw sliced Jazz Apple. 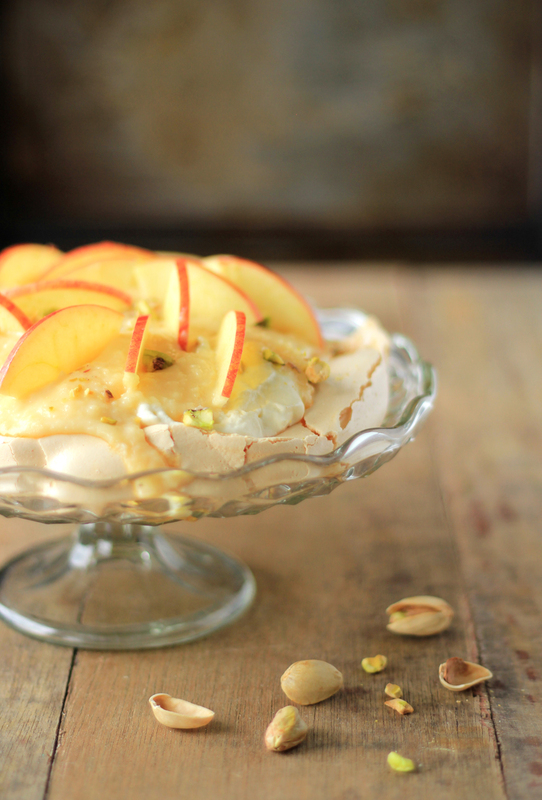 With a crunchy outer, marshmallow-like inner and awesome flavour combination this is what a Pavlova is all about. It’s a summery showstopper of a dish with all kinds of deliciousness. Jazz Apple is available in Aldi, Asda, Co-op, Lidl, Marks & Spencer, Morrisons, Sainsbury’s, Tesco and Waitrose. For more info visit: Jazz Apple or check them out on Twitter, Facebook and Instagram. Preheat oven to gas mark 1/275°F/140°C. Separate yolks from the egg whites and place the whites in a clean and dry mixing bowl. 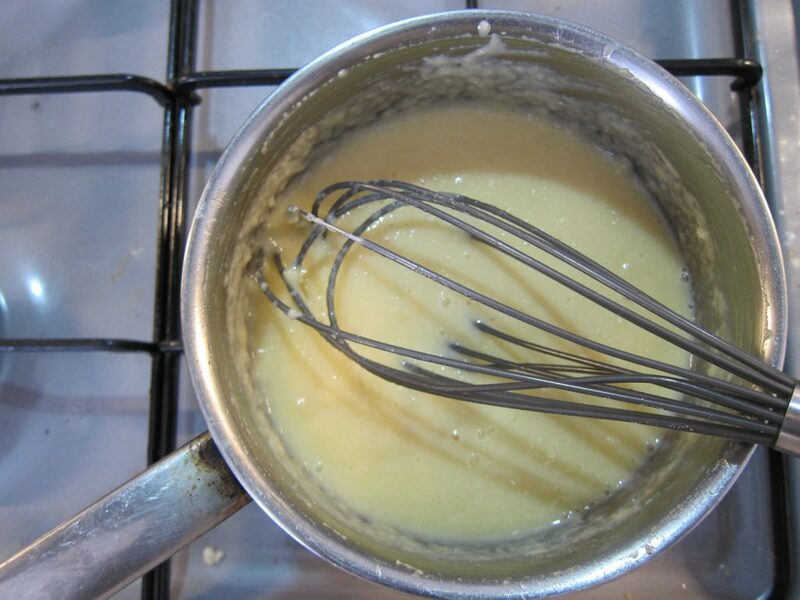 Whisk until you get soft peaks, mix the sugar and corn flour together and then gradually add into the mixture. 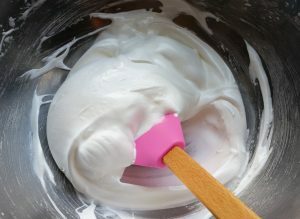 Whisk until the mixture looks glossy and peaks are stiff then fold in vinegar and vanilla extract. Place a tiny dollop of the mixture onto a baking tray and place some greaseproof paper on top. This will help to secure the paper. Then dollop the entire meringue mixture into the centre and create a dip in the centre. Bake in the oven for 1 hour then turn off oven and leave to cool for at least a further hour or more (you could even leave overnight). Do not open oven until then. Chop the first two Jazz Apples into eight cubes each, place in saucepan (no need to skin or deseed) and put enough water in the pan to come half way up the apple pieces. Cover saucepan with a lid. Cook on a medium to low heat until soft and pulpy. Once cooked, pour the Jazz Apple mixture in a sieve and using a wooden spoon press the contents through into a bowl, scraping the underside of the sieve as you go. Return the Jazz Apple mixture to the saucepan, return to heat and whisk in sugar, lemon juice and butter. Once sugar and butter dissolved take off the heat and leave to cool for a few minutes, then whisk in egg. Return to low heat and whisk continuously until sauce has thickened. This might take around 20 minutes. Take off the heat and leave to cool. Whisk whipping cream until you get stiff peaks. 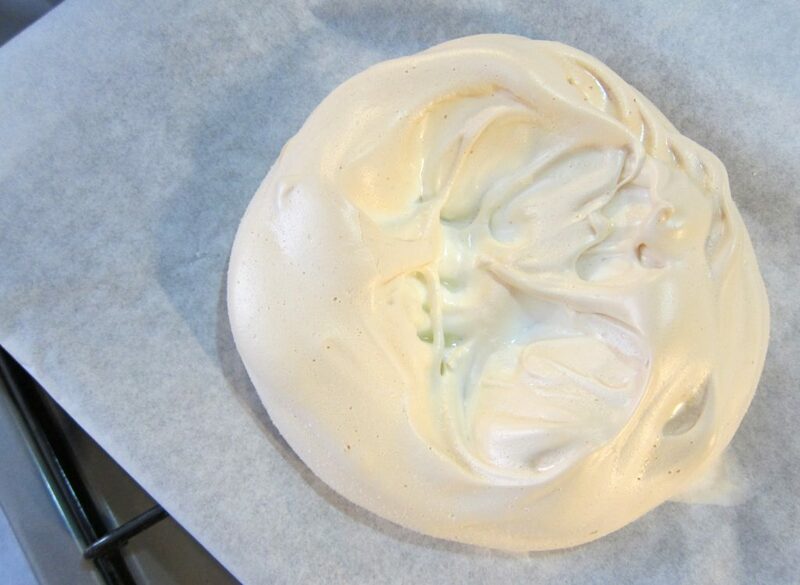 Place your Pavlova onto a serving plate. 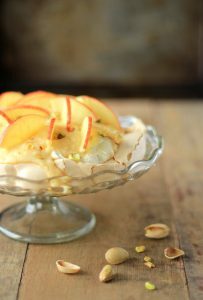 Layer it up first with whipping cream, then apple curd, then raw apple slices and finish with a scattering of pistachio. Serve and enjoy! Post and photography commissioned by Jazz Apple.